We have all reached the point in Cheesepalooza where we have entered the land of making Aged Cheeses. 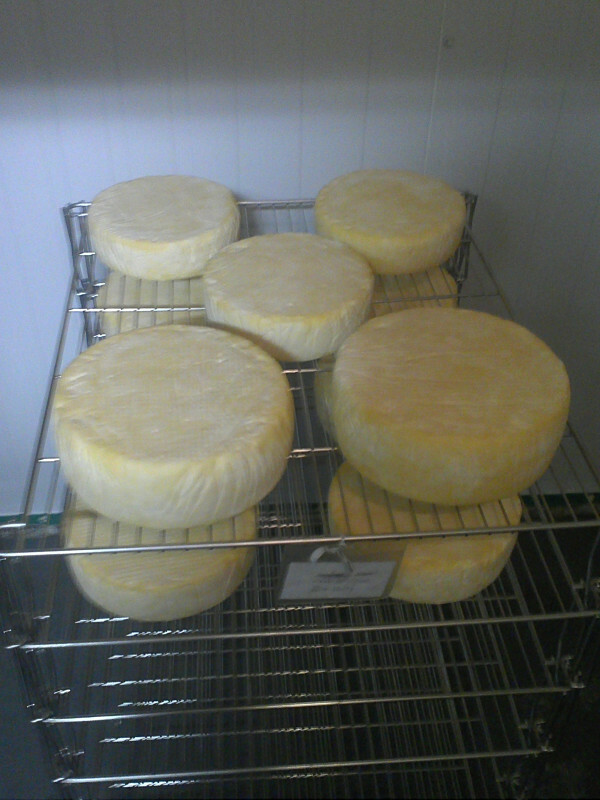 Some of them will take several months to age before you will get a decent cheese, but others will be ready in a matter of weeks. 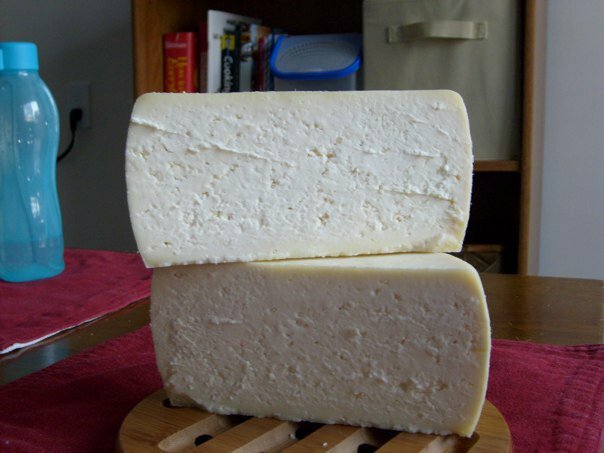 One of those cheeses that I like to make that is ready sooner than later is the Caerphilly. “Caerphilly is a hard, white cheese that originates in the area around the town of Caerphilly in Wales, although it is now also made in England, particularly in the South West and on the English border with Wales. It was not originally made in Caerphilly, but was sold at the market there, hence taking the town’s name. Now I have made several Caerphilly over the past 3 years, I was integral in the development of a new cheese coming from Smoky Valley Artisan Cheese called Callingwood that is a Caerphilly style cheese that I help to create with Leslie and Alex this past Thanksgiving, it was done with raw milk so it should be ready in December 2012 for sale. They are doing another version of the cheese called Redwater that they are using ARN (Surface ripening blend that includes B. Linens)wash on the rind and it should be ready in December as well. 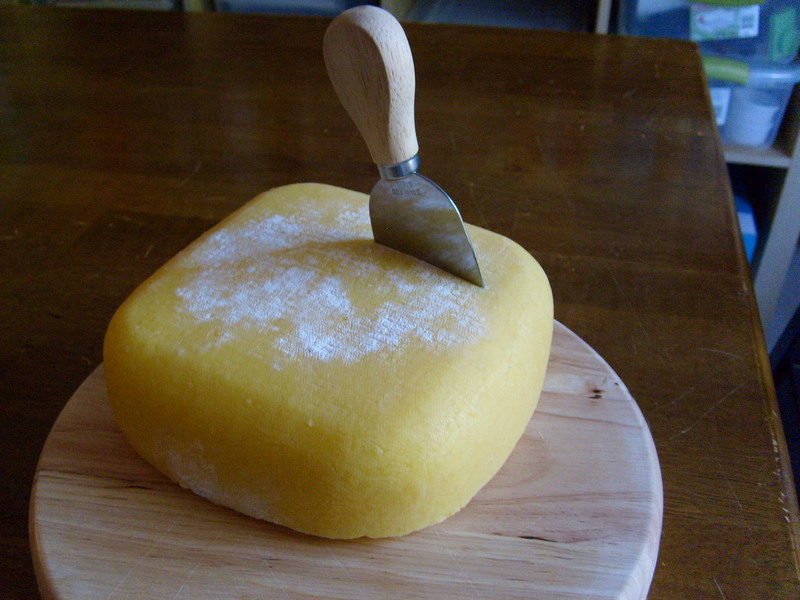 There are several ways to make Caerphilly, ones that include cheddaring (stacking the curd in slabs) others that don’t. I have tried several of them and I have written about them too. So in a similar stage of Valerie’s Round-ups for the cheeses here is my round up for my Caerphilly makes, well the ones I wrote about any way. 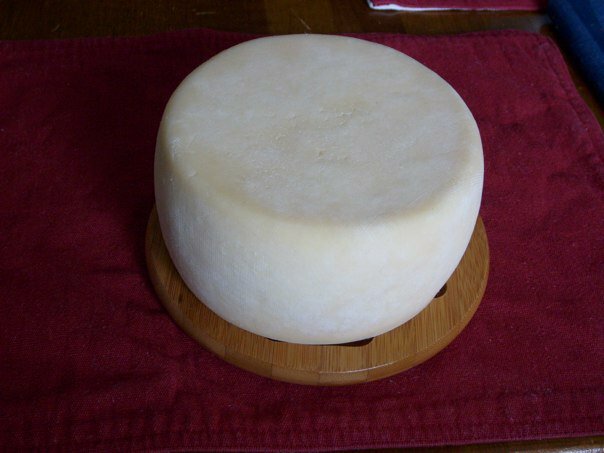 Caerphilly #1 – This was the first Caerphilly I had made; I was using the recipe from Gavin Webber of Little Green Cheese, it was done with 3.25% Homogenized milk and was my first time Cheddaring. I described the make briefly in Teacher’s Convention Project. This is a cheese that can be eaten at 3 weeks so I did open it up at 3 weeks to see how things went, they were glorious and delicious. The results were done in Caerphilly of my Dreams. The Interior was delightful and exactly what I was looking for. Caerphilly #’s 2 & 3 – Unfortunately these one I did not blog about, but the family was hooked and more was needed to be made. Caerphilly # 4 – ½ Regular – ½ Chilli Caerphilly This one I did write about, but not much at the time. 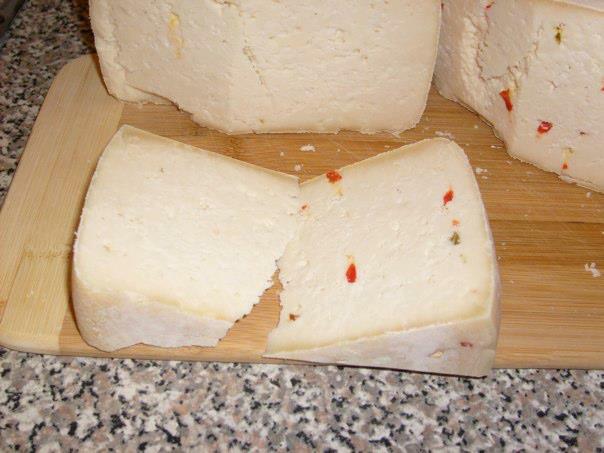 I used a mesh divider in the mould and added curd with chillies in one side and normal curd in the other. It seemed to work. The heat stayed on the chilli side and the other side was normal Caerphilly. This is where I determined I really do not like anything in my cheese. Don’t get me wrong it was a good cheese, but after a bit the chillies were a bit tiresome and I did not want to eat it any more. This was the cheese that I gifted to my son’s teacher. 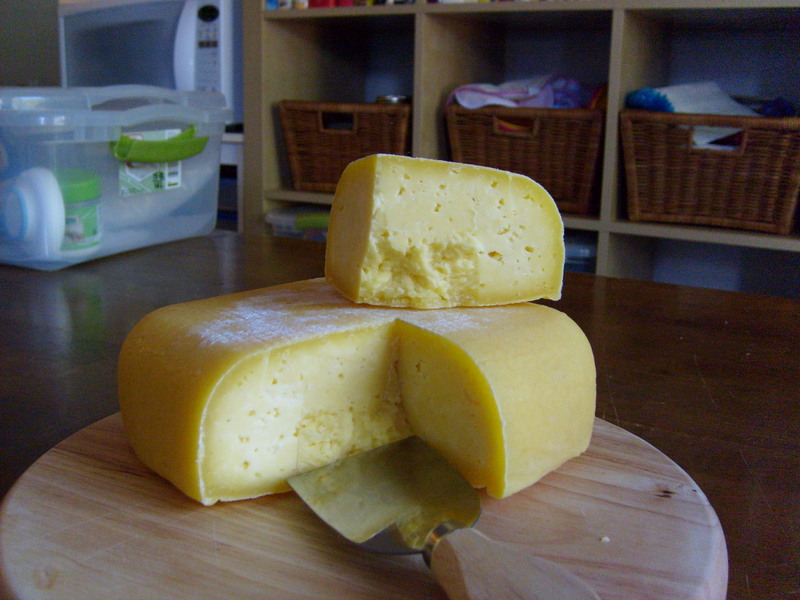 Caerphilly #5 – This was made in my Father’s Day weekend cheese making marathon. 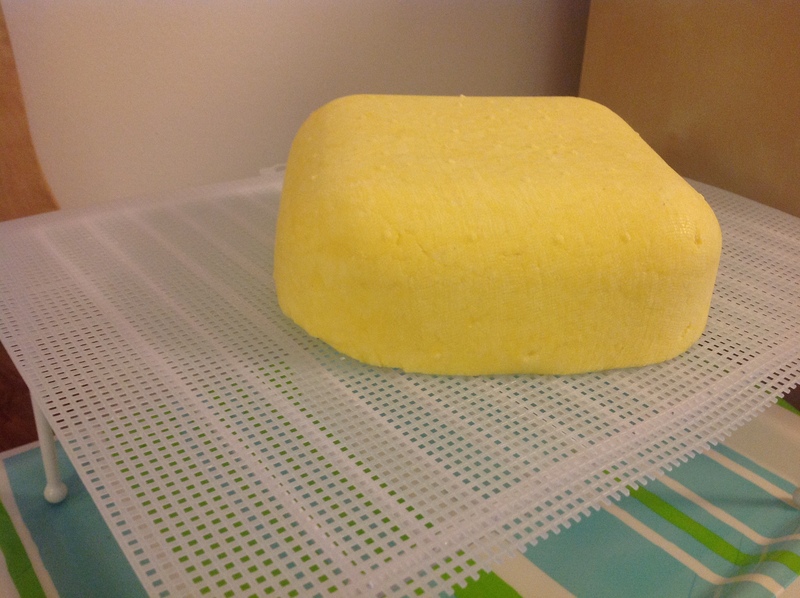 I made a sheep milk cheese on the Sunday and Monday I made my fifth Caerphilly. This one I made using the recipe from Mary Karlin’s book. It was an OK cheese I missed the cheddaring that I had done in previous makes, this one did not have the same texture as the other ones. I honestly would not make this version again. 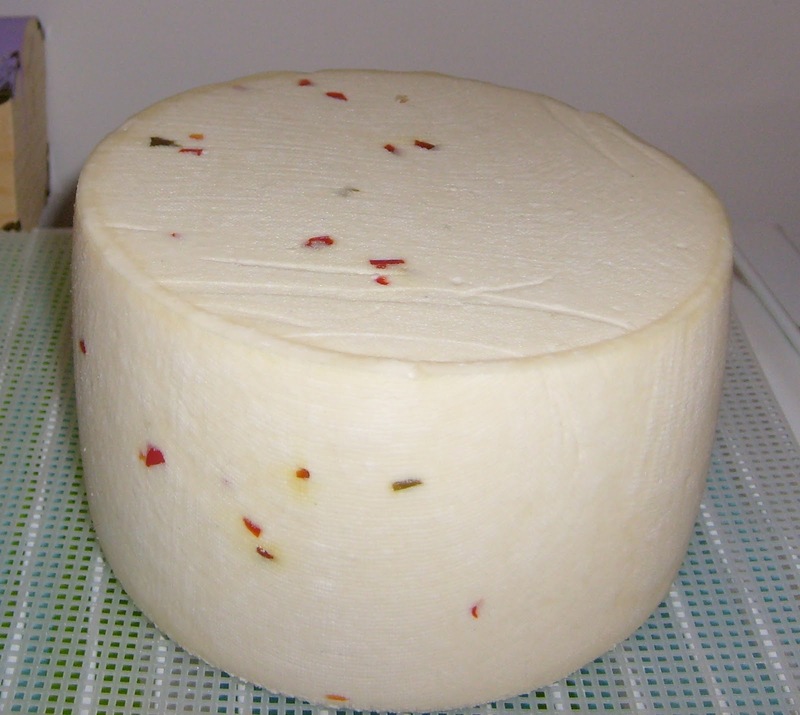 I used “fresh” Jersey Milk to make this one, the rind was quite hard. The pate did not look like my previous makes, nor was the texture there either. 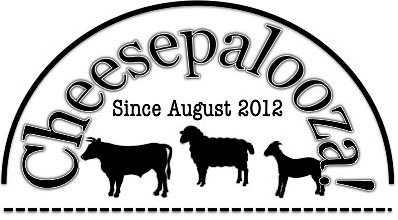 Caerphilly Assists – After the last Cheesepalooza tasting in October I helped Addie and Valerie make their Caerphilly using my own personal recipe. I am not sure if they are going to share it in their posts so I won’t post it here. If they don’t and you want it let me know and I will email it to you. I mentioned before that Addie and I went to Smoky Valley on Thanksgiving and I showed them my recipe for Caerphilly, which will be Callingwood and Redwater. I am hoping that they do very well for them and become a mainstay in their repertoire of cheeses. This is a 3.5 kg Redwater that was brought to the most recent tasting. Yes I made this! Caerphilly can be aged further out and the flavour will get more complex, it is a great semi-firm pressed cheese to start with, have fun with it and enjoy. If you are truly on the ball you can have it done and ready for your New Year’s Eve Cheese Plate. Go and make some cheese. What a privilege, again, with Wedge in the round to offer this incredible post for its readers. Your study on Caerphilly, here, is incredible, Ian. Absolutely incredible! Love the shape of your Caerphillys – what mould did you use? The plain white one looks absolutely decadent! Standing ovation. How lucky am I to have you for my mentor!!!! I am surprised that anyone actually reads my cheese ramblings, very happy that someone other than my mom does. Chris has reblogged two of my posts now. I feel honoured. Valerie, thanks I have been happy with all the Caerphilly except the square one. I used the hoop that came with my press for all but the square one, that one was a Chapman Special. Wow, you have a lot of experience with this cheese! They all look great, especially the Jersey and chilli ones. Ian, sorry I am late to the party. Fabulous cheeses! And solid photos. Nicely done. I look forward to your posts and I am very glad that you write such helpful articles. I have changed some of my own methods based on some of your advice. Great work! Thanks Rick, I am trying to improve the look of the site and trying to be informative at the same time. I try to research every cheese that I make.